The Hoare Blower is an easy to build barbecue smoker forced draft controller, for UDS/bullet smokers, and will probably work with other types as well. 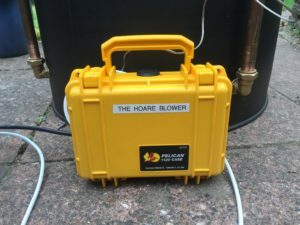 The Hoare Blower does the same thing as a BBQ guru type controller, however it is built almost entirely with parts from Amazon, and the total bill is about 60-80 dollars. 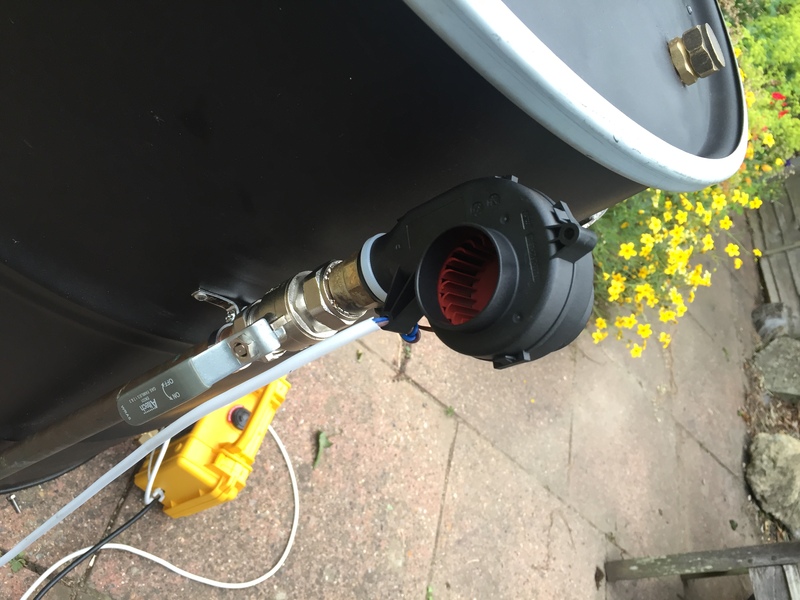 On my Ugly Drum Smoker (UDS), the Hoare Blower maintains temperature with heat bead briquettes with +/- 1 degree F, and with lumpwood, about +/- 4 degrees F.
– Uses a PID control loop (more about that in a bit) to control a small fan which feeds air to the fire in your smoker. By turning the fan on and off, the temperature can be accurately controlled. This is the fan on my UDS air intake. It mounts by simply sliding onto the 3/4inch thread. PID stands for proportional integral derivative. I don’t fully understand exactly what goes on with this, but I do know that PID control is quite an advanced and intelligent type of control loop. They are used a lot on precise motion and control systems. You may think that a controller like this might just turn the fan on when the temp drops below a certain threshold and off when it goes above another threshold. This is a very basic type of system, and would result in constant up and down variation of the temp. The PID loop on the other hand controls the output (a fan in this case) in such a way as to maintain a temp in a single position. It looks at the actual temp and the demand temp, works out the error and then uses complicated maths to decide what to do to the fan output to correct the error. The controller does this constantly, and the end result is perfect stable temp, even with a charcoal fire. The fan will blip on and off in a seemingly random way, but the controller knows exactly what it is doing. The controller also has an auto-tune function. When you enable this mode, the controller will experiment to learn how your smoker responds. It will blow the fan, and measure the temperature change. Then it will turn the fan off and measure the temperature drop. It does this a few times, and the system literally learns your smoker. After the autotune process is complete (about half an hour) it goes back into normal mode and holds the temp automatically. You do not need to do the auto tune every time, just do it whenever you change something, change the fan, or the fuel type etc. Even though this controller is about 30 dollars, the software and maths it performs is really very advanced. As mentioned, this temp control does not have any kind of meat probes. It also does not have any kind of remote temp read out. I recommend using a wireless two probe thermometer, such as the Maverick ET-732 in conjunction with your Hoare Blower controller. Place the pit temp probes and the controller probe close together, and you will also be able to confirm the accuracy of the temperature. You can set upper and lower alarms on the maverick so that if something happens to the Hoare Blower (this could be a failure or maybe sabotage by a jealous neighbour who does not have a Hoare Blower) the maverick will tell you. You do not NEED another thermometer to use the controller, but having one will make the system a lot more usable when cooking. 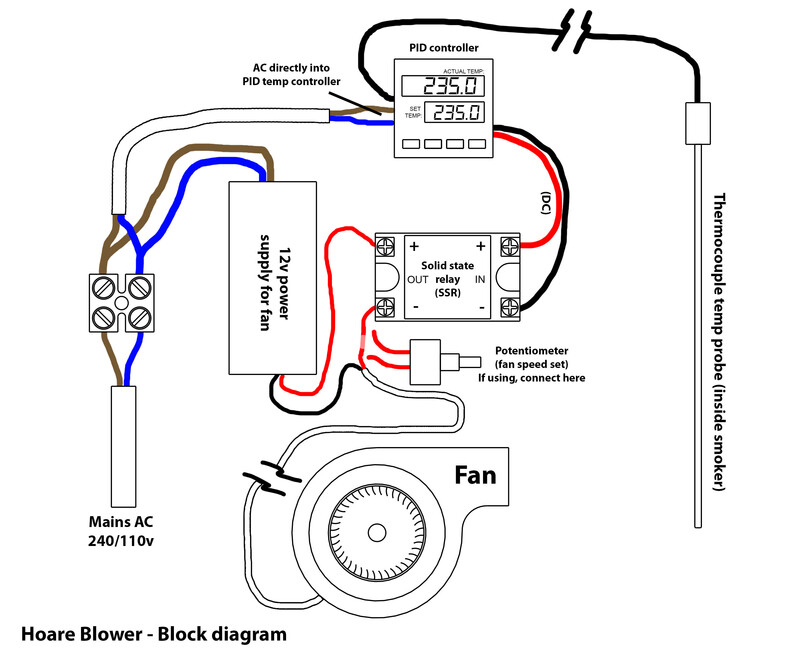 Whilst building the Hoare Blower is pretty simple, it does involve live mains AC current. Please be careful, and enlist the help of someone competent if you are not comfortable wiring this up. Always unplug from the mains when working on the wiring. I’m not responsible for keeping you safe, its up to you to not electrocute yourself whilst building this project. You will also need some kind of box to mount it all in, taking into consideration the fact that the system will be outside and may get rained on (I live in England so this is a problem for me). I used a Peli 1120 waterproof case. You could stick all the components down to a bit of wood if you liked, or you could make a nice fancy box for it. Don’t worry too much about the PID control being visible, I have mine enclosed inside the case. Once the system is running you don’t need to see the screen. 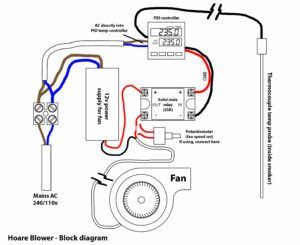 You need to choose a fan to use with your Hoare Blower. The fan I use is quite a nice industrial blower, made by EBM-Papst. It’s not that cheap, at about £33 GBP, but it is very small, very quiet and it fits over a 3/4in pipe thread with no modifications. I could not find a US supplier of this fan when I looked. The manufacturers part number is: RV40-18/12H. Maybe you will be able to find one stocked somewhere – If you do, please tell me and I’ll add it to this article. If you cant find this fan, then there are lots of other options. You need to choose a centrifugal blower type fan, do not attempt to use one of those axial PC fans. You need a fan that will provide some compression to force the air down the tube, and an axial fan won’t do this sufficiently. I actually used an air bed inflator pump for a while, and it worked fine, it was just a little bit noisy but at about $10, its cheap. The air flow rating of my fan is 14CFM, but I throttle it down using a potentiometer. The BBQ guru fan is 10cfm, so look for something in that region. Many of these fans have a square air output on them, so you will need to fabricate something to help mount the fan to the smoker. I thoroughly recommend trying to get hold of the EBM-Papst RV40-18/12H fan, as it works so incredibly well with the system. If you manage to find a supplier in your country, please let me know at pete.hoare@gmail.com, and I will add the information to this article. A rotary style potentiometer wired in series with the fan provides a bit of manual speed control. All this does is allows you to slow down the top speed of the fan. The controller does not vary fan speed, it just turns it on and off. If your fan is over powered (like mine is) then when the controller switches the fan on, it blasts air in too quickly to the fire, it heats up very quick and then the temp over shoots. Throttling the fan down using the potentiometer allows a more subtle and gentle control, which helps the PID controller. You may not need to add this, if you are using a less powerful fan, it might not be necessary. It is very easy to add this potentiometer, so my advice is, set the system up without it, and if you find the fan is too powerful and is causing over shoots, then add the potentiometer after. I recommend against suffocating the fan by partially obstructing the air input or output. This just makes the fan inefficient, and its noisy and not really the right way to do things. 90 percent of building the controller is wiring the parts together. I think its best to do this in stages, and that way if there is a problem, its very easy to see where the problem is. 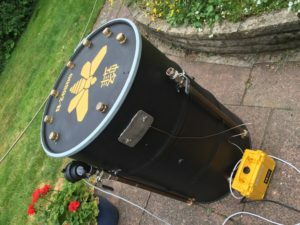 The first stage is to power the PID control and connect the thermocouple and test. -Connect AC mains (240/110v) to pins 1 and 2 on the Mypin PID controller. As this is AC, it does not matter which pin goes in to which terminal. The best way to do this is to get a cheap power cable, as you might plug in to a TV or a battery charger etc, and cut the end off, strip and bare the wires and connect them to the terminals. Obviously be careful whilst you do this, and don’t blame me if you hurt yourself. -Switch on the power supply, by plugging the other end of the cable in. The PID controller should light up. Check that the lights come on, but don’t expect to see a temperature figure yet. – These two terminals are now live with mains power. I strongly recommend covering them with insulating tape or hot glue gun glue to insulate them. The wiring on the back of my PID control. – The thermocouple should have red and blue plastic sleeves on the wires. 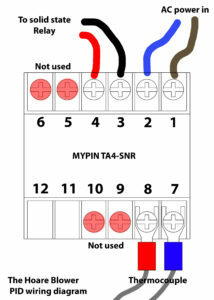 Connect blue to pin 7, and red to pin 8 (refer to my diagram). – Turn on the power to the PID control. After its boot up, a temperature figure should be displayed on the top read out. If your thermocouple wires are connected correctly, then as you warm up the probe, the temperature reading should increase. Test this by just gripping the end of the probe in your hand. If the temperature reading goes down instead of up, then swap the blue and red wires round on the back of the controller and test again. – Do not worry if the temp you see on the screen looks like the wrong measurement unit (C/F). This can be changed later to match your preference. Now you have the PID control reading the temperature properly, you need to wire the solid state relay up. The solid state relay takes a signal from the PID control and switches the power on and off to the fan. The reason the Mypin control is like this, and does not have this built in to the controller, is because the Mypin control is a universal device, which could control anything, not just one type of output. There are hundreds of sizes and types of SSR available, and in theory you could use a big heavy duty SSR to run a heating element in a huge brewery or industrial heater, with this PID controller in charge. – Terminals 3 and 4 on the back of the PID controller are for the SSR. Pin 3 is negative, pin 4 is positive (this is a DC output). See the wiring diagram. The SSR has a positive and a negative terminal. This step is as simple as just joining the terminals on the PID control to the terminals on the SSR, taking care to make sure that + goes to + and – goes to -. – Once you have done this, turn on the PID control with the mains power. There is a small LED on the bottom left corner of the PID control unit labelled OUT1. Whenever this LED is lit, then the LED on the SSR should also be lit. Both lights should light up red after a few seconds. – If the light on the SSR does not come on, but the OUT1 light on the controller does, then check the wiring and polarity. – If neither light comes on, check that the set temp (that’s the smaller green temperature) is LOWER than the temp currently displayed on the screen. Cool the probe down with some water, or change the set temp (refer to instructions for the controller for this). Now you need to connect the fan. The best way to see how to do this is to see the block diagram I drew. If you are not using a potentiometer, then ignore this and imagine the wire in and out of the potentiometer are connected together/the same wire. – Wire the 12v power supply into the mains. 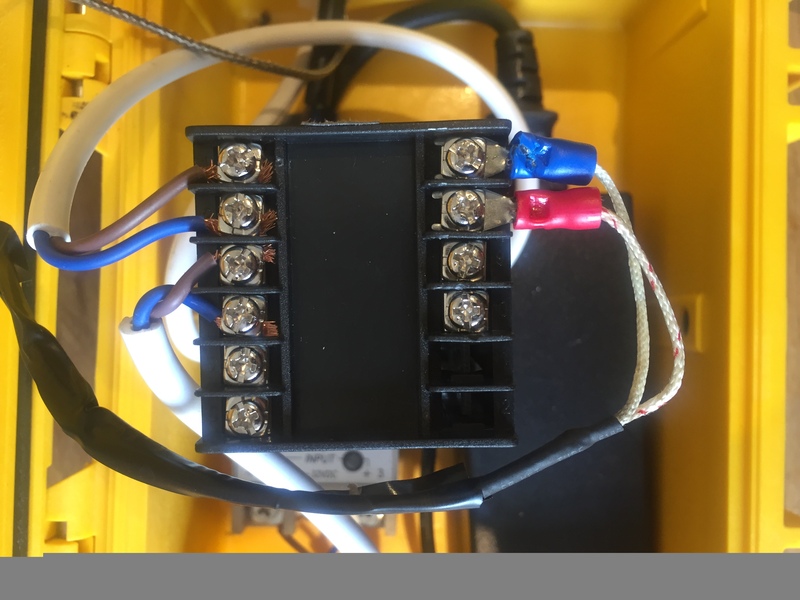 The best way to do this is to use a chocblock style terminal block, with the mains power coming in on one side and both power for the controller and the 12v power supply coming out of the other side. – Take the positive wire from the power supply and wire this into the positive marked terminal on the OUTPUT side of the SSR. 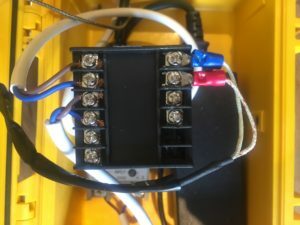 – What you are doing here is creating a simple circuit with the SSR wired in to break or connect the power. – I advise that you put the fan on the end of a 6ft long cable, so you can place the controller on the floor with enough wire to reach the smoker. Turn the system back on with the mains power and as the light on the SSR and OUT1 illuminate, the fan should start blowing. If you wish, you are now ready to test the system. Attach the fan to the smokers air intake, put the probe on the food grill, and follow my instructions for lighting the smoker. Once you have tested it, box everything up. Insulate anything live, the chocblock that splits the mains AC for example, should be insulated. Wrap in insulation tape. Cover all bare metal terminals on the SSR and on the back of the PID controller. The SSR and PID control does not really get hot. You can seal the whole thing inside a box like I have done in my pelicase, or you can choose to mount the PID control with the front panel mounted on the outside of the box for easy access. In the UK, as a metric country, we use Celsius as our temp measurement unit. However, the barbecue community, as it is so heavily influenced by the American bbq world, uses fahrenheit. My PID control came set in C as default, so I had to change it to F to use it with my barbecue. Any units purchased in the states may be set to F already, or they may all come set to C. To change the unit, follow the instructions that came with the PID control. -First thing you need to do is set the temp. Turn the system on, and once its done booting up, press the << A/T button one short sharp press (dont hold). The last digit will flash, thats this one – 000.X. The up and down arrows will change the value of this number. Press << A/T again and it will make the next digit flash (00X.0) Use the up and down arrows to change. Press <<A/T again to make the next one flash – you get the picture. You need to change each digit separately to type in your temperature, its not the most intuitive system, but to get 235F, you would need to set the first digit to 2, the second to 3 and the third to 5. Once you have this, press SET to commit the temp. The system will now turn the blower on – You don’t want this yet. Turn the whole system off, next time you turn it on, the temp will be right and ready to go. -Put the probe on the grill, as you always would with any other type of bbq thermometer. -If you’re using a UDS or bullet smoker, open all the lower vents, and do not attach the fan yet. – Set up your charcoal basket and add your burning coals. Assemble the smoker, add the baffle, water pan, food grill (with temp probe attached) and lid. – Monitor the temp using a Maverick type thermometer. Once it gets fairly close, maybe 200F (if your aiming for 235) then shut all the lower valves, and connect the fan. -Turn power to the Hoare blower on. -The fan will come on and start blowing air into the smoker. That’s it – Just leave it for an hour or so for everything to heat up and stabilise. Before you do an autotune, it will hold within maybe +/- 6-7F. Do not do the auto tune until the entire smoker is hot. The autotune is what really makes this controller work well. Whilst the auto tune is happening do not change anything. Don’t open the lid, don’t open or close any vents, don’t fiddle with the fan, don’t do anything. Do not touch a thing whilst the auto tune is happening! To turn Auto tune on, press and hold the << A/T button on the controller. The little green AT light will light. Leave the controller to do its own thing, when that light is on, that means auto tune is in progress. It will take 30-40 mins, and once its done auto tuning, the light will go out. Thats it. 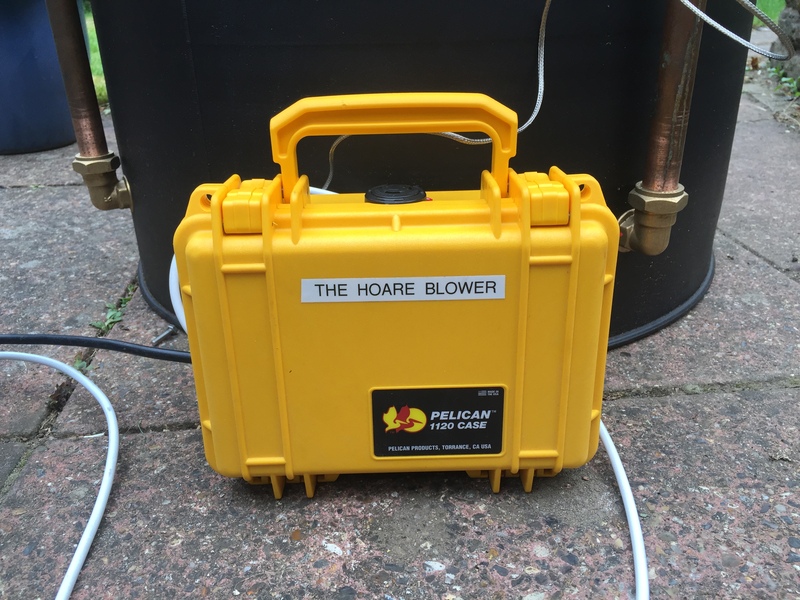 The Hoare Blower is now in charge. If you feel the fan is too powerful, add a potentiometer to slow it down a bit. If you take the lid off the smoker to check the food (do this as seldom as possible) then its best to turn the Hoare Blower off about 10 mins before you plan to do this. This calms the coals down so that when you take the lid off, the rush of oxygen to the coals dosn’t cause too much of an over shoot. As always, be as quick as possible with the lid off. Do your poking/saucing (and obviously photographing) as quickly as you can and get the lid back on. Once the lid is back on, give it a few mins before you turn the Hoare Blower back on again. You can turn the blower on and off whenever you like, and as soon as you turn it back on, it will pick back up from where it left off. There is no harm caused by turning it on and off. Other fans will work. Check the section about the fan to help identify a suitable fan. I recommend the above fan as it is very well made, very quiet and fits perfectly over a 3/4in pipe thread. The Thermocouple listed for the US link has 2 blue leads, and 1 Red, instead of just 2. How do those need to be wired? Thats strange. Best thing is to experiment, you wont break anything if you connect it up wrong. Id start by connecting a blue and the red and seeing if it works. If you heat the probe up and the temp goes down, then swap the wires over on the controller. Play with it and see what works, and once you have got it working, can you let me know what wiring worked out for you, so I can update the blog for others. That was kind of my plan of action, but I will be sure to let you know when I get it rolling. This is the same thermocouple except available in the us on prime. I couldn’t get the 3 wire thermocouple to wire up and work correctly, so I ordered the 2 wire thermocouple I posted a link to. I wired it up today, and it works perfectly. You may want to update the US link with the link I have posted. So the link for the 12 volt power supply is a 6 amp supply and you state a minimum of 2 amps is recommended. Any reason to have the higher amp output? The fan will only take 1-2a max, but the 6A power supply is so cheap, there is no harm in using a bigger one. Also, a 2A PSU running at 2A output will get hot, and it will strain the power supply. A 6A PSU running at 2a will barely break a sweat, it wont get as hot, and its less likely to break in the middle of the night and ruin your food. Also this leaves headroom for a bigger fan, or two fans working in tandem on the same power supply. Remember, when it comes to current, its just a max rating of what it can supply, rather than what it forces from the output. The fan will take what it wants, so you could connect it to a 300A output and it wouldn’t behave any differently to if it was on a 6A output. Thanks for the write up – all pieces ordered and looking forward to building! One question: what potentiometer would be required? There seem to be lots of different types! cheers for the great write up have ordered all the parts and am going to try and build one. The only problem is I ordered the PID but they have sent me one with SSR output by mistake. They said I could return it but is there any way to make that work with the rest of the set up? or would i need to get something else? Hi Pete. I’ve just build myself one of these as I had a PID lying around from brewing. I have the same fan and am suffering temp swings. It’s set to 120 (before and after tune) and I’m seeing swings between 112 and 124. That’s with the fan throttled back to around 5 volts with a potentiometer. Any ideas? Also, could you post the PID settings you have please? It may help make a manual adjustment rather than relying on the auto tune.